Andrea Scott is an English artist based on Hayling Island, Hampshire. Known for her coastal canvases, Scott spends a lot of her time sitting by the shore, generating ideas inspired by the elements of the British coastline. Drawing inspiration from the subtle but powerful variations in the light and shape of the ocean, Scott captures the dramatic seascapes of the West Country and the Isles of Scilly like no other artist. Visit our Andrea Scott artworks page to browse our collection of her artwork. Andrea Scott’s career proves that the sea can be a bottomless source of inspiration. Growing up in England, Scott has described the Scilly Isles and Cornwall as “lifelong influences,” pointing to their rugged coastlines and quality of light as specific qualities of intrigue. Her paintings are all titled ‘AS’ followed by a number, with the initials representing either ‘Andrea Scott’ or ‘abstract seascape’ (it is up for the viewer to decide). Over her career she has painted hundreds of these abstract seascapes, many of which now hang in private collections and galleries around the country. 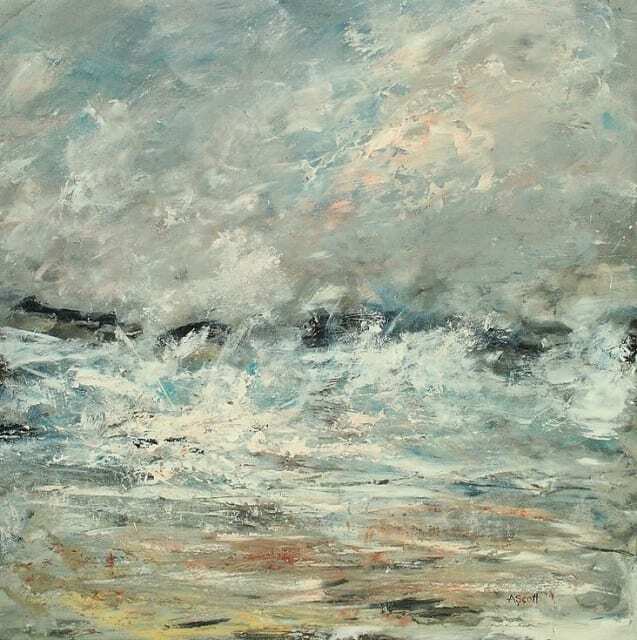 To capture the spirit of the sea in paint, Scott uses palette knives, brushes, and any other nearby natural materials. Her preference is for natural, beachcombed items and plant fibres. Adding these items to her work gives the pieces an enhanced originality and experimental flair, perfect for portraying something as temperamental as the sea. Scott uses these materials and techniques to paint impressionistic, abstract works, with both the look and, perhaps more importantly, the feel of the ocean. The mixed media approach conjures up a sense of the drama and unpredictability of nature. Scott also places focus on the unrestrained rhythm of an artwork, which she describes as liberating. And, like the sea, she says her pieces can often radically change direction during the course of their creation. Andrea Scott’s artworks continue to delight buyers around the country, as they relish at the artist’s visceral depictions of nature’s most powerful and awe-inspiring force.